Every year there are games that we are all hyped up and eagerly waiting for, and every year some of the drop the ball. 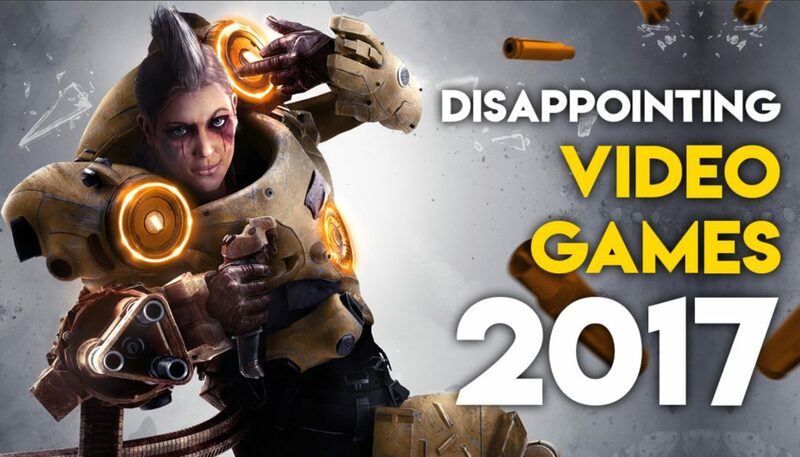 So here are the top 10 most disappointing games of 2017. These aren’t necessarily bad games, these are just game we expected better from. This one is probably the most obvious pick. To be honest, I did enjoy Mass Effect: Andromeda’s combat and exploration a lot. However, I was really hyped for this game, especially because I absolutely loved the original trilogy. Andromeda, sadly, never reaches the same heights. At it’s core, Star Wars Battlefront 2 is an enjoyable game. It’s just so disappointing to see how badly EA screwed this over with their insatiable greed. As a shooter, it’s probably one of this year’s bet, but it still doesn’t hide the fact that it could’ve have been so much better. Also, the main campaign was a sore letdown. I can’t believe that they’ll hold it up as canon. It’s not easy to recreate the magic of old platformers, while still making a great modern game. Yooka-Laylee is fun, but the lack of gameplay refinements and numerous launch issues left a bad taste overall. Valkyria Chronicles is one of my favorite JRPGs, and I was left sorely disappointed in this half-baked addition to the series. Forgettable characters and a story that drags on forever was what made this prequel absolutely unnecessary. This is another game that many might disagree with. If you’re someone who values games for simply the amount of content they offer then you can go nuts with Shadow Of War. Too bad that a lot of the content is repetitive, and after the 10 hour mark, it just feels like you’re doing the same thing over and over again. As much as I enjoy Overwatch, my personal preference tilts more towards a faster skill based shooter. that is exactly what Cliffy B promised with LawBreakers. Surprisingly enough, the game totally delivered on the promise. It’s incredibly fun, fast paced and feels great. Sadly, the terrible marketing and launch tactics has now left the game is a state with almost no playerbase. The few left playing the game have to put up with lengthy and uneven matchmaking. After Saints Row 3 and 4, I was willing to play anything that Volition threw my way. Just Not Agents Of Mayhem. Please, anything but Agents Of Mayhem. Playing Marvel Vs Capcom: Infinite always left me feeling like there’s a great game hiding right beneath the surface. Sadly, dig as I did, I was never able to really find those good bits. I honestly was not expecting much from Need For Speed, especially after the last few terrible entries in the series. However, EA’s E3 presentation of Need For Speed Payback actually left me hopeful. I saw glimmers of older Need For Speed games and even some Burnout in there. Sadly, the final release was another lootbox driven grind-fest. Sure, the core racing feels alright, and recent tweaks have eased some of the issues, but it still is disappointing to see such a great franchise reach such new lows. A small team of Polish devs was trying to play catch up with most AAA titles but in the end, it ended up being a game with solid shooting mechanics mashed with a boring story, bad driving mechanics and horrible load times. So those were the games that left us disappointed. What about you? Who did you disappoint? Let us know in the comments below.